Today we want to show Farming Simulator 19 Collectors Edition for PC and whats included in this pack. 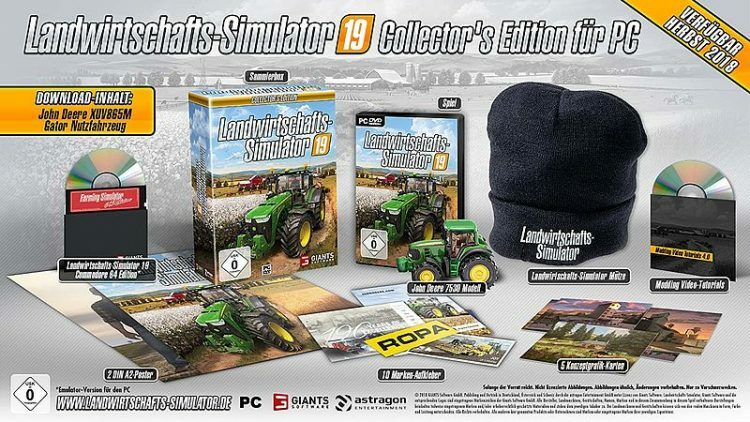 Like every series of Farming Simulator game, FS19 also will have a Collectors Edition, which is has a lot of interesting stuff for real gaming fan. – 5 concept graphics cards. This pack will cost EUR 49.99 (Amazon). And when there’s gonna be one box for PS4 available? when will the english version of farming simulater 19 collectors edition come out???????? Ich kann es kaum erwarten .